Anyone remember what these guys have done for Memorial Day promos in recent years? Wondering what they might have on deck for this year. STILL lurking around, STILL considering another build...I think I can swallow hard and pull the trigger so long as I keep to my own self-imposed rules. Must have RW board and must have a finished neck - I refuse to order other boards or tung necks after my most recent build experiences, but aside from that I'm confident enough to make it happen. A promo would sweeten the deal a bit. I don't remember what they've done specifically over the last few years though. Their promos lately seem to have been model-specific, with packaged options, and most of the time - additional (but limited) choices. the specials seem to happen randomly and not always tied to a holiday. the most common are free soft case or $100 of free options. Used to do free ss frets but that is standard now. The occasional pick your top day is a great way to get a deal too. Something about the Zeus keeps yanking at me... it could be fun. I dunno.. I have an inquiry in an an AmPro Tele here in NY, used, at a great price. Will depend what happens. But I like the idea of grabbing a multiscale with this limba-y beast in vintage yellow.. the dark ebony board would be the business.. probably would change the body to full gloss and just satin neck. Well it's Friday...thus far it looks like we'll be getting bubkes this year. No biggie, was just hopeful. Would you be willing to upload some audio samples of how the M22's sound in this build? You have a standard traditional hog/maple build, correct? I don't think a korina top and bottom would sound that much different. In fact I think it would sound very similar to an all koa guitar. 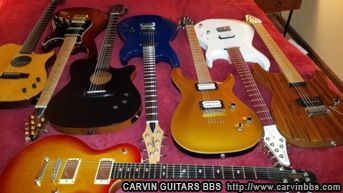 I would really like to hear how these pickups would sound in this build style.. obviously I already have them in an LP style guitar, but my old Carvin has a Gibson style angled neck (as opposed to the straighter neck on the CS), is Gibson scale, and of course, unrelated to Gibson sound but to these pickups is 24 frets. I don't know that I've ever heard M's in this guitar.. The sounds I'd most be interested in hearing is 1) clean in all positions, and 2) breaking up just a bit, but loud.. kind of like that juicy "pushed Plexi" sound that Page, Clapton, Beck, Frehley, Kossoff, Hendrix and a million others rode to glory, where you can ride the volume and tone knobs within a song really effectively. Do you have the V or the N in your neck position? I ask because I don't really have a lot of pickup options to match my wants for this guitar, ie that super flexible PAF tone that can go in so many different musical directions, but the M's are definitely the closest, since they were designed as drop in replacements for Gibson in the late 70's. They're definitely louder, and all A5 mags, but they're definitely in the right ballpark tonally. Would you do that Doug--very short sweet, a chord or two in each position with a couple sustained notes up and down the neck? No need to show off, or feel on the spot. But if you can't, believe me I understand. I might be able do something crappy with my phone. I don't really have anything to record with. And it's a V in the neck. IO have an N in the neck position of my Godin and actually like that one better. Well, something would be better than nothing (ie Beggars Can't Be Choosers). I'd be mostly listening for that trademark midrange and how it pronounces from out of the highs/lows. Thing about that Zeus demo with the Beryl's (and other demos I've heard), is it's a sound unto itself and it's kind of lacking a fatness and warmth.. they're very "tinkling" "sparkling" and they don't have the low mids and mids that a typical PAF style humbucker grunts out. I think I like them more than the Lithiums, but they seem like they might be a little staid for what I would want to use them for. That said, I still want to hear more and wish I could play them. This is the one downside of the mail order end of things. I have a build with Beryliums coming and I have some worries about them as well. I have a drawer full of pickups just in case. I don' think the output will be high enough.